Tom has been an online writer for over seven years. He is enamored with everything related to cowboys, rodeos, and western history. Cows, or cattle and cowboys, seem to have been joined at the hip for as long as we can remember, and that has extended to our culture overall, making cows an interesting choice for tattoo designs; as they're not only considered a food source, but in fact have become a pet in the eyes of many people who bought some cattle for the purpose of raising them for food. I've seen more than one person do this, and the key I have found is to be sure not to name the cows you acquire for eating purposes, as you've just about assured yourself that they'll be around for a long time, especially when you look into those long-lashed eyes and get a feeling of guilt over thinking you ever thought of killing them. After all, who's going to eat Bessie, one of the more popular names I've heard applied to female cows. With that in mind, most of the cow tattoo designs shown in this tattoo gallery are of a fun nature, with the exception of one of a bull, which is snorting fire through its nostrils. Technically, when using the term cow it is referring to a female that has had one or two calves (depending on what region it is). The term heifer is used for a female that hasn't had a calf yet. 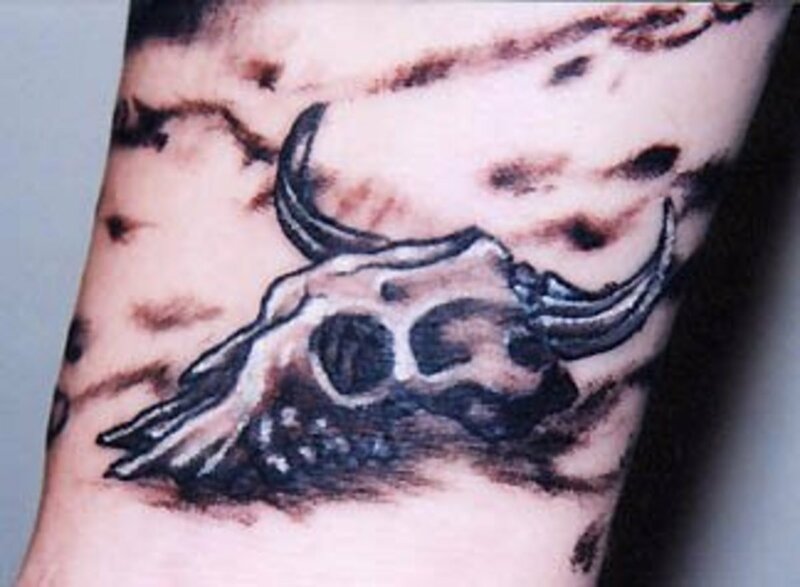 One interesting thing I found concerning cow tattoos was with the bulls, they are usually depicted in some fierce manner, as many people remember watching their sometimes unpredictable behavior, usually on the wild side. For cows or heifers, they are almost always designed in a more humorous manner, making bulls and cows, in most circumstances, a completely different tattoo. 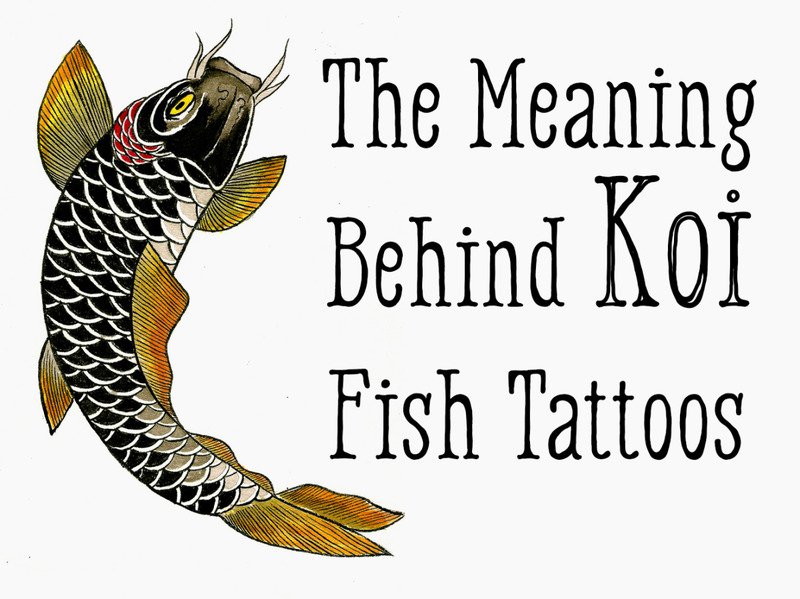 Now let's look at some tattoo designs. This is one of my favorite cow tattoos, as it is the epitome of what a cow is considered in the mind of someone acquiring one for meat and then how she appears when you look at those 'trusting' eyes. Also fun is the way the ears stand out to one side, also seemingly adding to the trust factor. Finally, the decision to have a cow with white and black colors offers up the idea of what most of us think of as a traditional cow, meaning what most of us think of when picturing what one looks like. I also like the way the cow is facing directly out, suggesting you're standing right in front of it and looking into its eyes. Here is a unique cow tattoo, based upon the interesting design. 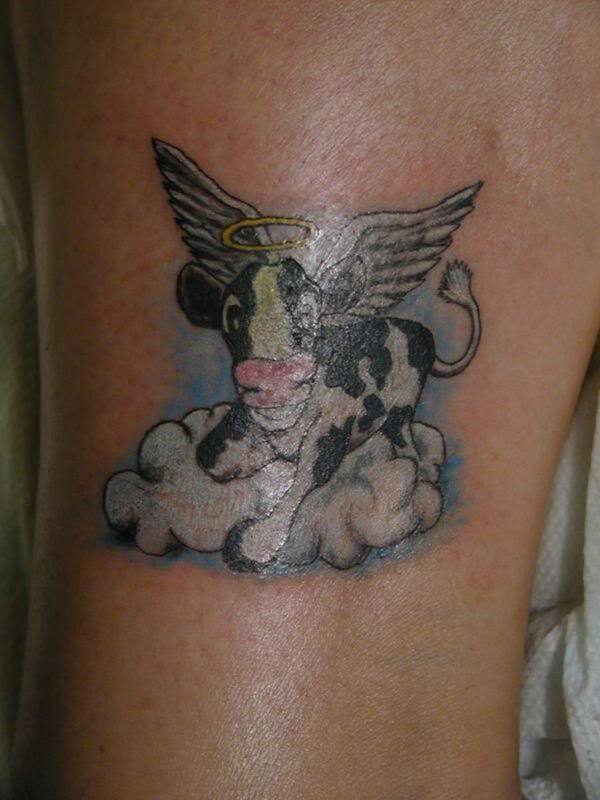 I think this may be a tattoo chosen for the memory of a beloved cow. You have to have had a cow as a pet to understand this. 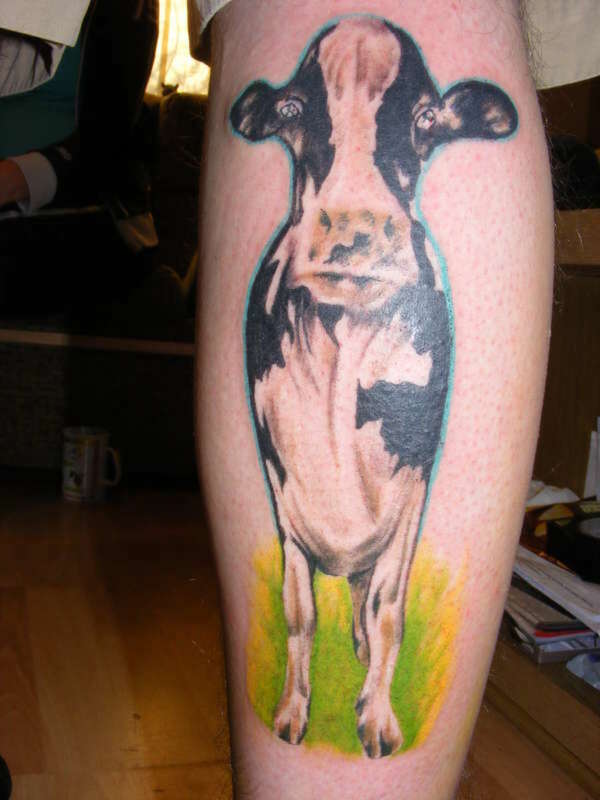 This is a nicely designed tattoo, with vibrant colors a terrific and quality depiction of the head of the cow. The scrolling moving up the arm and behind the lotus flower really works well, resulting in showcasing the cow head, which is the center of the tattoo design. 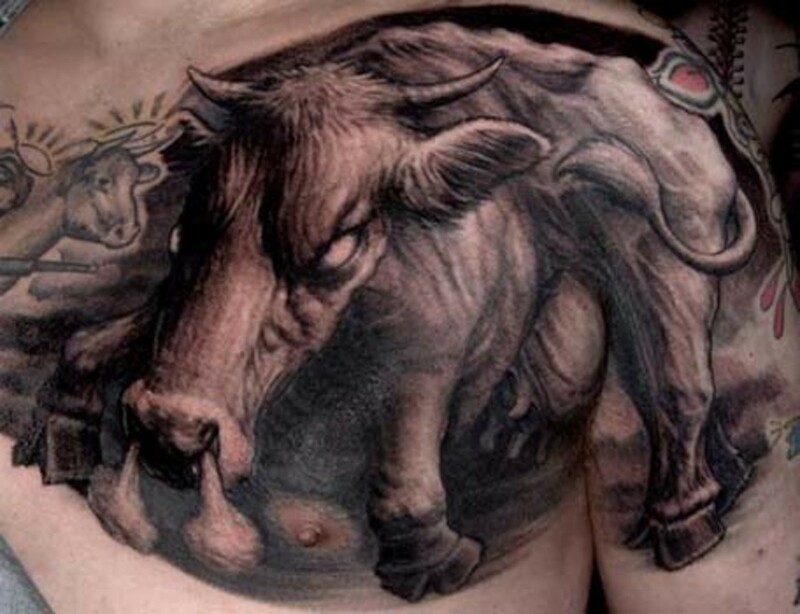 This is a funny bull/cow tattoo, as the artist - whether by design or mistake - created a tattoo of a bull's head with a female cow's body, as evidenced by the utters. The awesome depiction of the bull's snorting head disguised the utters at first, so I didn't see them. 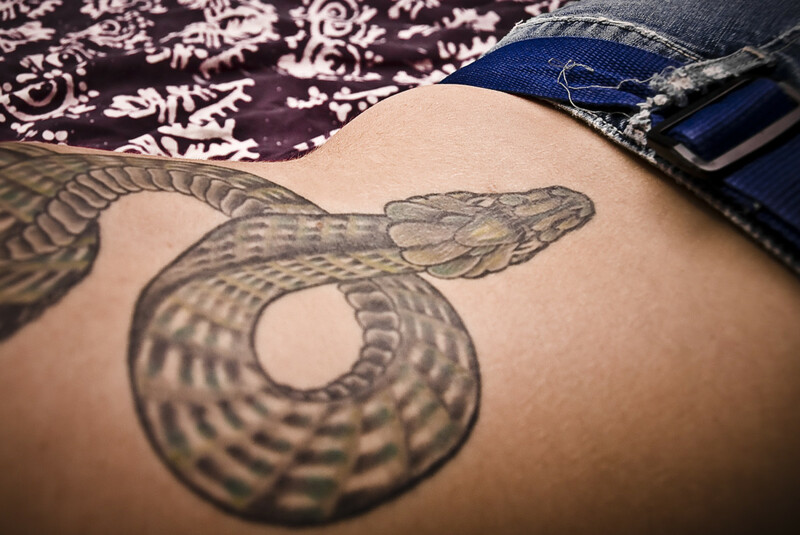 That doesn't take away from the high quality of the tattoo, but does give a little different perspective on the design. 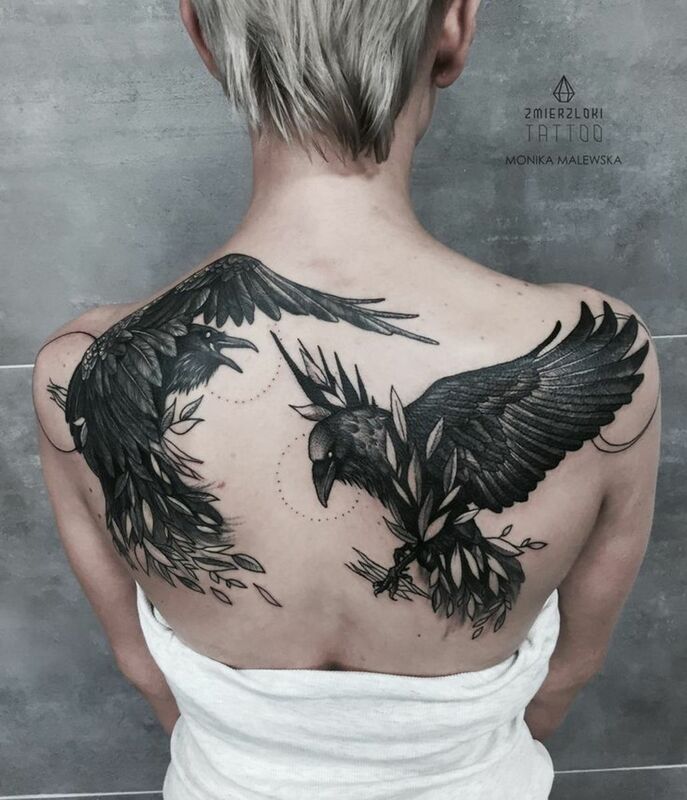 What I really like is the detail of this tattoo, as the musculature of the beast is magnificently done, revealing the sinewy muscle of the powerful animal. The way the shadow is done to intensify the power is also fantastic. Overall a great bull/cow tattoo, but one that leaves you scratching your head as to whether or not it was done purposely or not. It seems it was probably done on purpose. Here again we have a cow tattoo design showing the love someone had for a favorite cow. To me it's funny to see someone think so highly of a cow, in the sense of designating 'angel' status to it, but again, it's understandable from the way I've seen people interact with their pet cows. 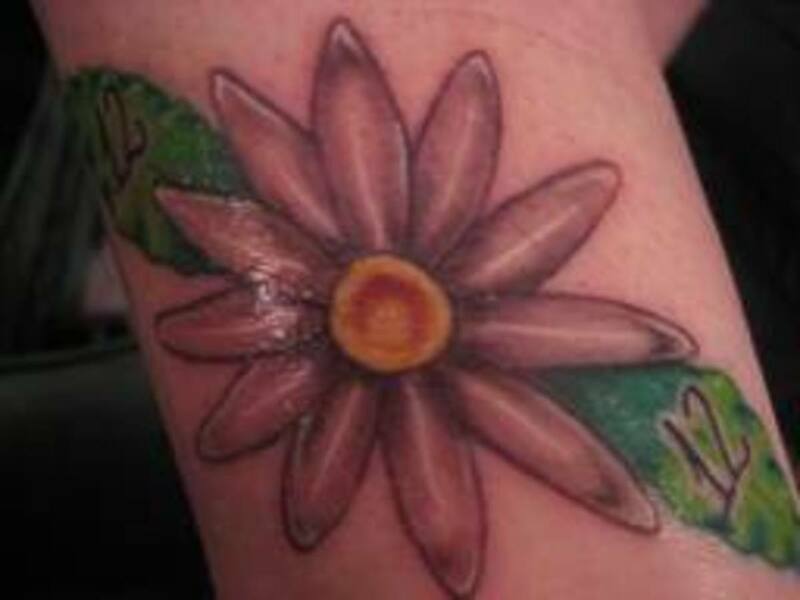 Either way, it's a nice tattoo, showing a frolicking calf with nothing of this earth bothering it any longer. That smiling face, big eyes, and ears pointing out, capture the essence of how someone imagines their departed friend. 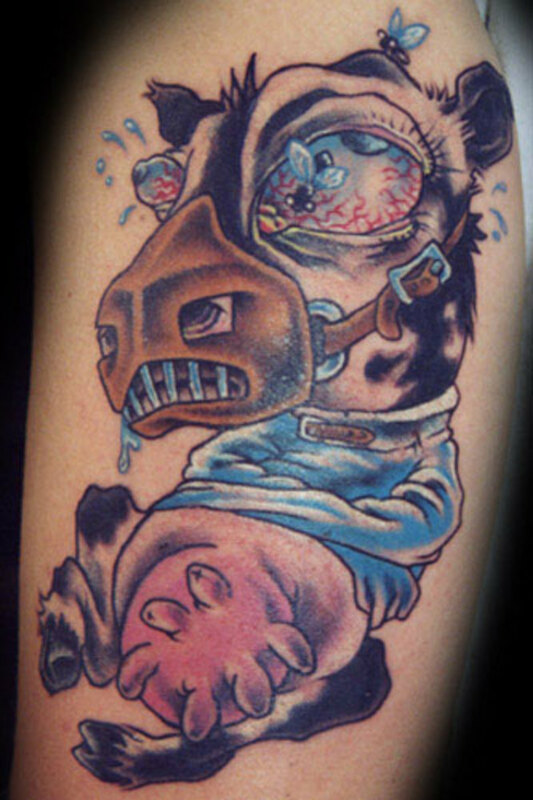 If you follow the cattle industry at all, or at least are aware of mad cow disease, you can appreciate the humor associated with this tattoo, depicting a caricature of the unfortunate disease which occasionally afflict cattle. While a serious disease, I do love the way the artist offers up some humor as far as this cow goes. It's hilarious the way the bloodshot eyes are bulging out, with the straight jacket made to appear to be keeping her safe from herself and others, and the muzzle on over her mouth, apparently in place to keep her from harming anyone else. 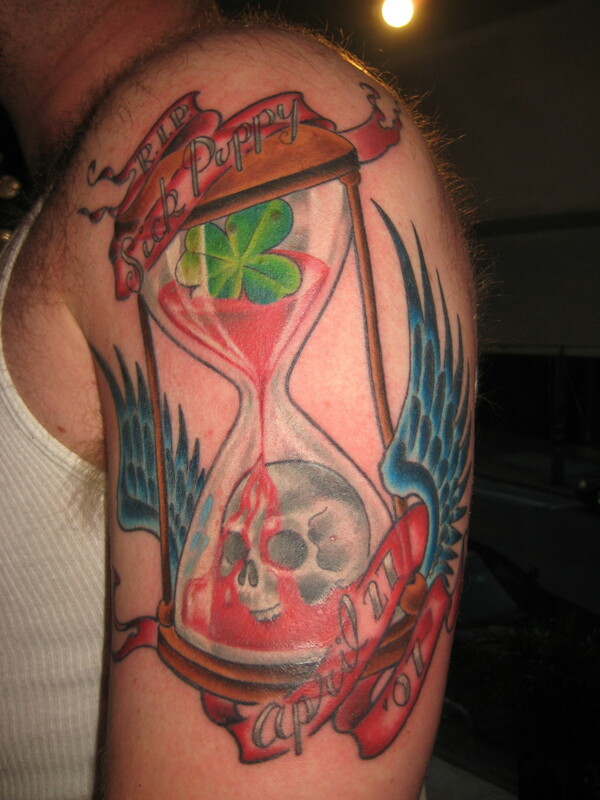 Either way, I love the play on the theme, and the tattoo is as funny as it gets. I hope you enjoyed this quick look at the variety of cow tattoo designs in the gallery. 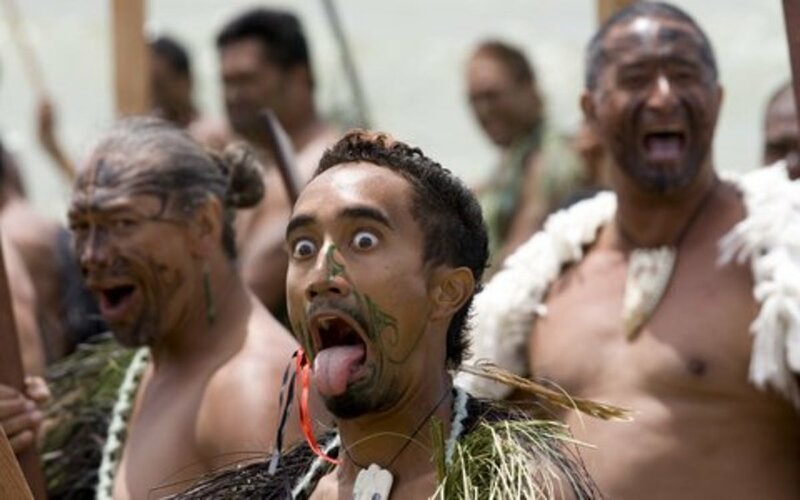 They showcase a number of human reactions and observations of cows, primarily from those who decided they're not going to eat their cow, and rather are going to raise them as part of the family. It also shows the humorous and serious side of cows, offering a variety of cow tattoo design options for those who appreciate the subject matter.